The cross join gives all possible combinations of rows in the two CTEs - see below for what the results should look like. There are 9 possible combinations. 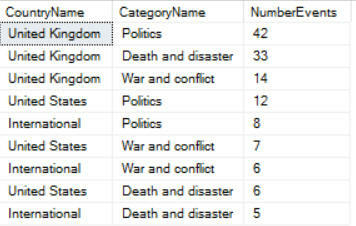 United Kingdom / Politics is the combination of country and category which has the most events. Save this as Country category combinations, then close it down. I have completed the main task but i cannot be able to append the NumberofEvents column - please help me with this. We don't give out additional technical help, but maybe some kind reader would oblige?